‘Deer to be different’. That’s their motto. To put that into context somewhat, Lenny is a Deer and he is the front man for Super Lenny. Confused? Well, don’t be. Lenny is one of those guys who works hard and plays hard, as you can tell from the portrait of him dressed in a tuxedo! OK, so it’s a pretty unusual mascot to have as the face of an online gambling site, but it’s different, and in this industry, being different is not as easy as it may seem. Behind the façade of Lenny is actually a very good and improving online casino and sportsbook. The company have been in operation since 2013, but in reality, the people behind the name (Betit) have decades of experience with them, which clearly shows as you work your way through the bookmaker. Whilst the company has a very limited background compared to most, it’s been refreshing to see that SuperLenny have decided to take their own approach as to how they are going to go about becoming successful in the online betting industry. But, the bookmaker is far more than substance over style and as they continue to offer their services to more countries around the globe, they continue to expand and in turn, improve. The first thing that really jumped out at us on SuperLenny is the overall, design of the site. As we mentioned earlier, the brand is still pretty new and to come out with such a clean, yet exciting design must be credited. It’s hard to say what design features really stand out, but it’s more just the simplicity of it all without loosing that modern feel. The range of sports and markets on offers is an area that is continuing to improve, although we will say that its got some way to go before really challenging with the larger brands in this sector. Football and horse racing will make up the bulk of your markets and then interestingly you are moving on to more American bases sports such as American Football, Ice Hockey, Baseball and Basketball which are arguably the next best catered for. Whilst SuperLenny certainly aren’t the only company offering markets for these sports, we were quite impressed with the depth that they’ve gone into for each. 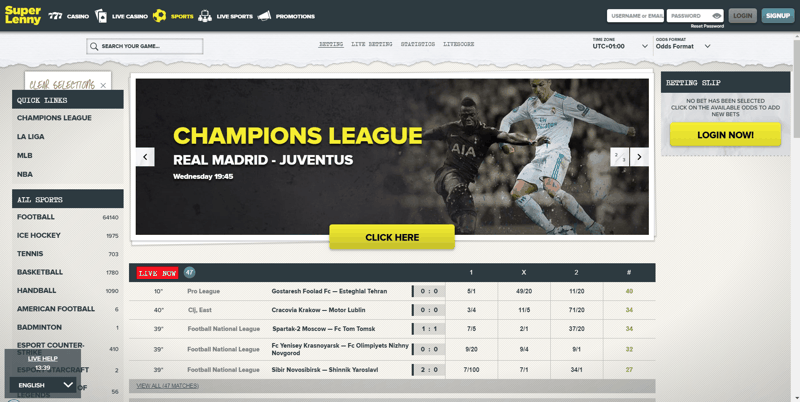 The live betting section is a really pleasure to use and we feel that its probably the companies best feature. They have dozens and dozens of matches to bet on every day and also from a huge range of sports. Whilst some aren’t keen, we actually liked the long list of games that are kicking off at any given time and then seeing how markets are changing or reacting by being colour coordinated. In fact, the ability to see the change in pricing and odds for so many markets at once is very impressive indeed. Finally, whilst not necessarily a feature, we wanted to highlight how exciting it is to see SuperLenny react to the market in such a short period of time. They are part of a new bread of bookmakers where they come in hard and fast, stacked with features, but we cant help but feel that SuperLenny are at the top of the emerging tree and not very far away from taking a serious crack at some of the bigger players in the industry. Super Lenny works in conjunction with several casino software providers including NetEnt, Thunderbird, Microgaming, Nyx, Quickspin and Play and Go. These guys are some of the best in the business and what makes it even more appealing is that SuperLenny then hand pick which games they take from each provider. The casino doesn’t have a ridiculous number of games to choose from, but there are over 200 slots on the platform. This isn’t a huge amount, but in reality its more than any one player will likely ever get through. Plus, they quality of the games are that good that you don’t mind having slightly less choice than some of their competitors. The jackpots games was probably the most impressive section we tested, merely for the inclusion of both Mega Fortune and Mega Joker, both titles being widely regarded as some of the highest paying jackpot games in the industry. DP World Tour Championship 2017 Preview: Is a Repeat of Masters Magic on the Cards?